In this famous portrait of Beethoven by Joseph Karl Stieler, Beethoven can be seen working on the Missa solemnis. The Missa solemnis in D major, Op. 123, is a solemn mass composed by Ludwig van Beethoven from 1819 to 1823. It was first performed on 7 April 1824 in St. Petersburg, Russia, under the auspices of Beethoven's patron Prince Nikolai Galitzin; an incomplete performance was given in Vienna on 7 May 1824, when the Kyrie, Credo, and Agnus Dei were conducted by the composer. It is generally considered one of the composer's supreme achievements and, along with Bach's Mass in B minor, one of the most significant Mass settings of the common practice period. Despite critical recognition as one of Beethoven's great works from the height of his composing career, Missa solemnis has not achieved the same level of popular attention that many of his symphonies and sonatas have enjoyed. Written around the same time as his Ninth Symphony, it is Beethoven's second setting of the Mass, after his Mass in C major, Op. 86. The mass is scored for 2 flutes; 2 oboes, 2 clarinets (in A, C, and B♭); 2 bassoons; contrabassoon; 4 horns (in D, E♭, B♭ basso, E, and G); 2 trumpets (D, B♭, and C); alto, tenor, and bass trombone; timpani; organ continuo; strings (violins I and II, violas, cellos, and basses); soprano, alto, tenor, and bass soloists; and mixed choir. Kyrie: Perhaps the most traditional movement, the Kyrie is in a traditional ABA' structure, with stately choral writing in the first movement section and more contrapuntal voice leading in the Christe, which also introduces the four vocal soloists. Gloria: Quickly shifting textures and themes highlight each portion of the Gloria text, in a beginning to the movement that is almost encyclopedic in its exploration of 3/4 time. The movement ends with the first of the work's two massive fugues, on the text "In gloria Dei patris. Amen", leading into a recapitulation of the initial Gloria text and music. Credo: The movement opens with a chord sequence that will be used again in the movement to effect modulations. The Credo, like the Gloria, is an often disorienting, mad rush through the text. The poignant modal harmonies for the "Et incarnatus" yield to ever more expressive heights through the Crucifixus, and into a remarkable, a cappella setting of the "Et resurrexit" that is over almost before it has begun. Most notable about the movement, though, is the closing fugue on "Et vitam venturi saeculi" that includes one of the most difficult passages in the choral repertoire, when the subject returns at doubled tempo for a thrilling conclusion. The form of the Credo is divided into four parts: (I) allegro ma non troppo through "descendit de coelis" in B-flat; (II) "Et incarnatus est" through "Resurrexit" in D; (III) "Et ascendit" through the Credo recapitulation in F; (IV) fugue and coda "Et vitam venturi saeculi, amen" in B-flat. Sanctus: Up until the Benedictus of the Sanctus, the Missa solemnis is of fairly normal classical proportions. But then, after an orchestral preludio, a solo violin enters in its highest range—representing the Holy Spirit descending to earth—and begins the mass's most transcendently beautiful music, in a remarkably long extension of the text. Agnus Dei: A setting of the plea "miserere nobis" (have mercy on us) that begins with the men's voices alone in B minor yields, eventually, to a bright D major prayer "dona nobis pacem" ("grant us peace") in a pastoral mode. After some fugal development, it is suddenly and dramatically interrupted by martial sounds (a convention in the 18th century, as in Haydn's Missa in tempore belli), but after repeated pleas of "miserere", eventually recovers and brings itself to a stately conclusion. The orchestration of the piece features a quartet of vocal soloists, a substantial chorus, and the full orchestra, and each at times is used in virtuosic, textural, and melodic capacities. 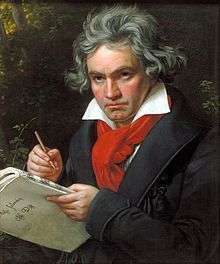 The writing displays Beethoven's characteristic disregard for the performer, and is in several places both technically and physically exacting, with many sudden changes of dynamic, metre and tempo. This is consistent throughout, starting with the opening Kyrie where the syllables Ky-ri are delivered either forte or with sforzando, but the final e is piano. As noted above, the reprise of the Et vitam venturi fugue is particularly taxing, being both subtly different from the previous statements of the theme and counter-theme, and delivered at around twice the speed. The orchestral parts also include many demanding sections, including the violin solo in the Sanctus and some of the most demanding work in the repertoire for bassoon and contrabassoon. A typical performance of the complete work runs 80 to 85 minutes. The difficulty of the piece combined with the requirements for a full orchestra, large chorus, and highly trained soloists, both vocal and instrumental, mean that it is not often performed by amateur or semi-professional ensembles. Not even Bach or Handel can show a greater sense of space and of sonority. There is no earlier choral writing that comes so near to recovering some of the lost secrets of the style of Palestrina. There is no choral and no orchestral writing, earlier or later, that shows a more thrilling sense of the individual colour of every chord, every position, and every doubled third or discord. ↑ See Beethoven: Missa solemnis, Op. 123, Kyrie; Tutzing: Schneider, 1965; facsimile ed. ↑ Gutmann, Peter. "Ludwig van Beethoven: Missa Solemnis". Classical Notes. Retrieved 8 September 2011. ↑ Adorno, Theodor W. Alienated Masterpiece: The Missa Solemnis. Essays On Music. University of California Press. 2002. p. 570.